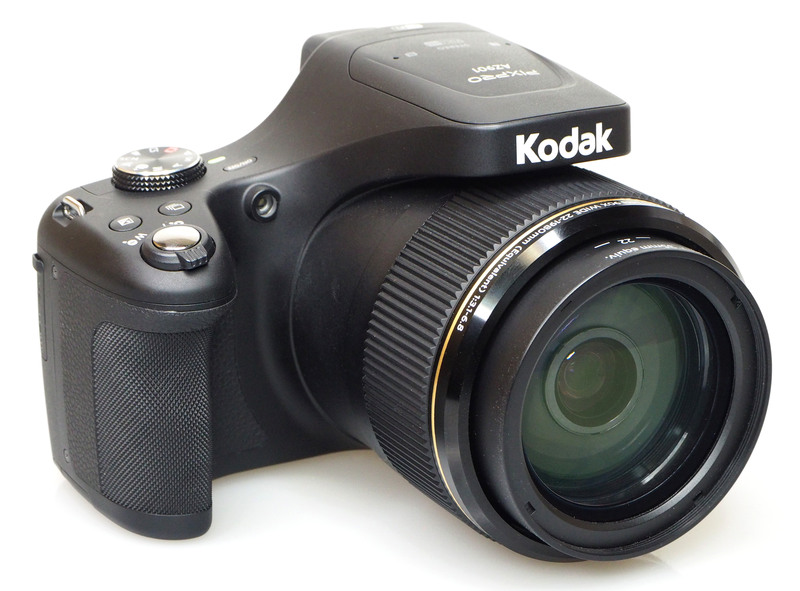 We review the Kodak PIXPRO AZ901 - a 90x optical zoom lens ultra zoom bridge camera. The Kodak PIXPRO AZ901 offers an impressive list of specifications, starting with a 90x optical zoom lens, a vari-angle screen, and built-in electronic viewfinder (EVF). Unfortunately there are some issues that are unavoidable. The appeal of the ultra zoom bridge camera has always been the massive zoom lens on offer. However, as ultra zoom cameras have continued to chase higher and higher optical zoom numbers, has the ultra-zoom bubble burst? 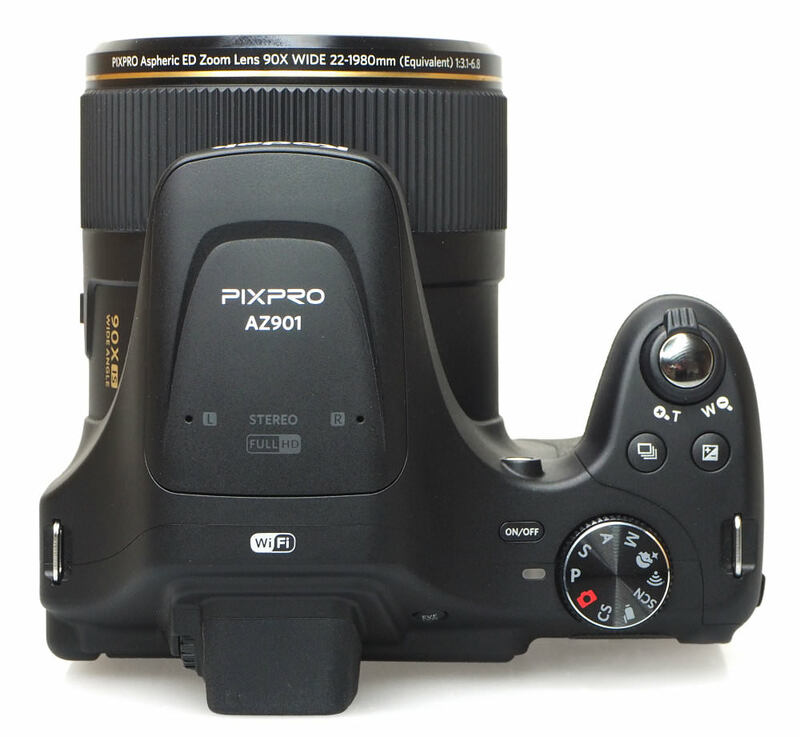 The Kodak Pixpro AZ901 has a 90x optical zoom lens and is hoping this will make it a popular choice. The Kodak Pixpro AZ901 offers a 90x optical zoom lens, the biggest optical zoom of any bridge camera, offering more than the 83x optical zoom Nikon Coolpix P900. 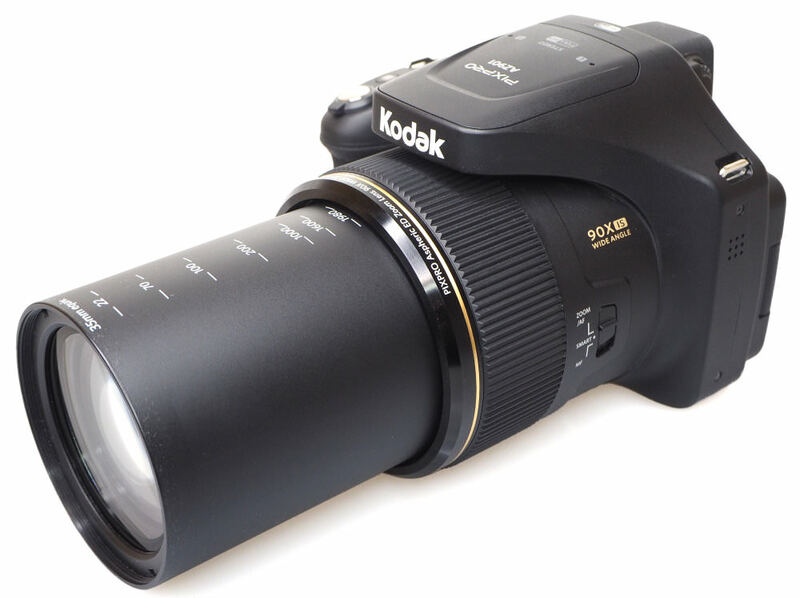 The Kodak Pixpro AZ901's 90x optical zoom lens zooms from 22mm to 1980mm equivalent (in 35mm terms) and features a 20-megapixel 1/2.3inch sensor, a 3inch vari-angle screen, and a built-in electronic viewfinder (EVF). 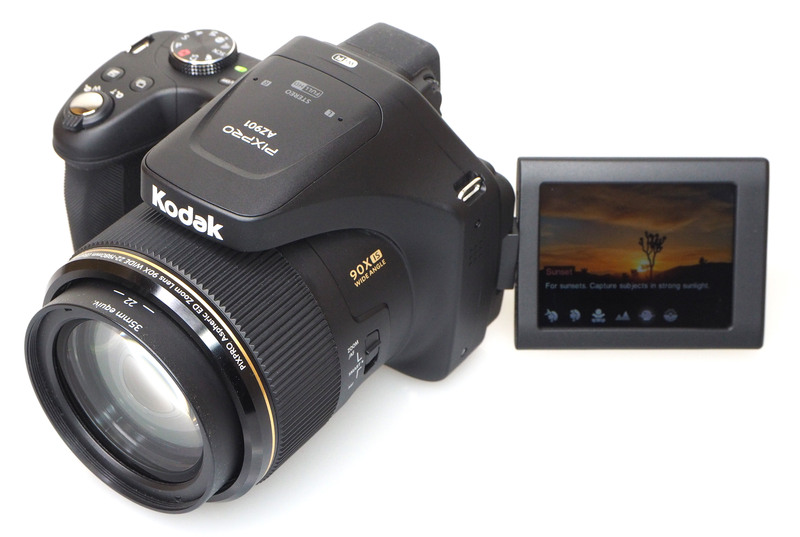 Other ultra-zoom bridge cameras still available include the 83x optical zoom Nikon Coolpix P900, the 65x optical zoom Canon Powershot SX60 HS, the 63x optical zoom Sony Cyber-shot H400, the 60x optical zoom Nikon Coolpix B700, and the 60x optical zoom Panasonic Lumix FZ82. The Kodak Pixpro AZ901, like many bridge cameras, offers full manual controls, plus raw shooting. There are numerous scene modes, and auto modes so that the camera is also easy to use for beginners. The Kodak Pixpro AZ901 offers a 90x optical zoom lens, the biggest optical zoom of any bridge camera! 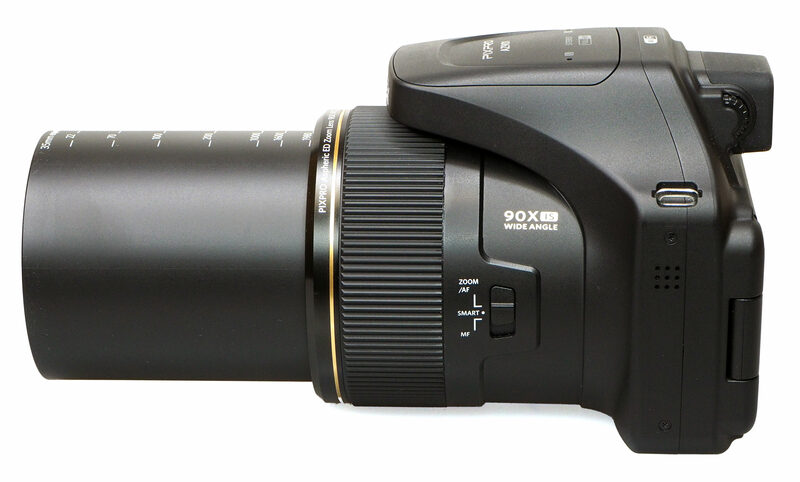 The 90x optical zoom lens covers a range from 22 - 1980mm (* equivalent), and features an f/3.1 to 6.8 aperture. The lens is made up of 18 elements in 14groups and offers 5cm macro focus (wide-angle). There are numerous Colour and filter options, plus Kodak film modes with Ektachrome, Kodachrome and Kodacolor film available. You'll also find a number of other colour options and effects, including: Normal, Vivid, Black and White, Sepia, Partial Color-Red, Partial Color-Yellow, Partial Color-Blue, Partial Color-Green, Dreamy, Vignetting, EKTACHROME Film, KODACHROME Film, KODACOLOR Film, Salon, Punk, Negative, Reflection, Sketch, Fish Eye, and 4 Grids - Stylish(2M). Wi-Fi is built-in, letting you remotely control the camera, as well as transfer images to your smartphone. You can record FullHD video with stereo sound, and you also get to use the 90x optical zoom lens while recording. The design of the AZ901 is similar to DSLR, with a large grip for your right hand, and a large lens on the left-hand side. Holding the camera with two hands is a good way of keeping it steady. However, there is no rubber grip on the left-hand side of the camera (when viewed from the back). 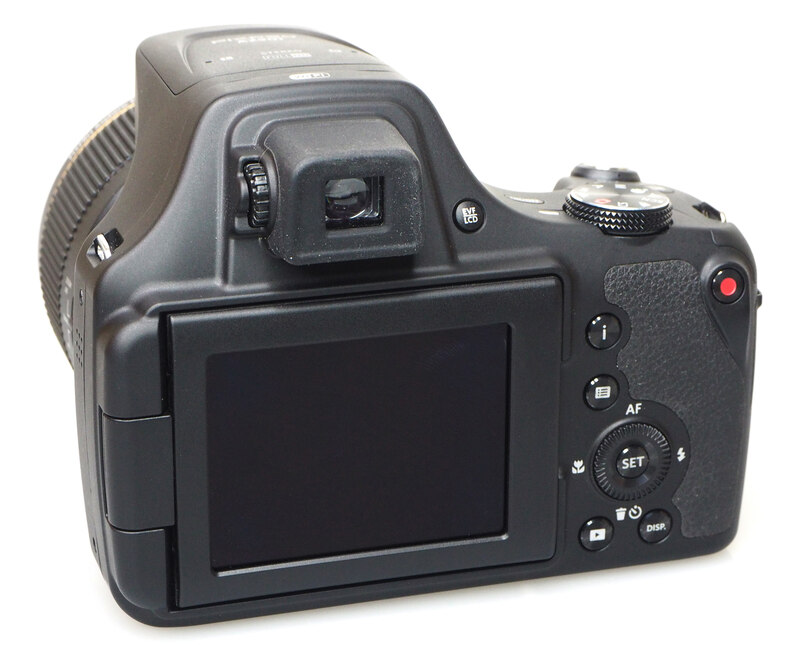 On top is a mode dial, the on-off button, drive mode, plus exposure compensation buttons, as well as the shutter release button which is surrounded by the zoom rocker. The top pop-up flash will automatically pop-up when you switch on the flash, or when needed in Auto mode(s). To close you simply push it back down. On top of the flash, you'll find the stereo microphones. The EVF doesn't feature a sensor (to tell when you are holding the camera up to your eye), and you have to switch manually between the EVF and screen, which can be frustrating at times. However, the camera will automatically switch to the EVF when you fold the rear screen away. The EVF has dioptre correction -3 and +1, and a rubber surround. The screen looks good, with a clear display, good colour reproduction, and good viewing angles. The buttons on the camera give quick access to drive mode, exposure compensation, AF, macro, flash and self-timer. The i button lets you choose different film/colour modes. To change settings on the camera, where there isn't a direct external button, you press the button that looks a bit like a menu. This brings up an on-screen overlay of controls. You'll find some of the most commonly changed settings. From here you can go to the Menu's either by going to the top of the options, or the bottom of the options. In the menus, you'll find 2 photo menus, a playback menu, setup menu and Wi-Fi menu. Image options include RAW+JPG (JPG Best), Raw, JPG Fine and JPG Best. JPG Best is better than Fine, and gives a 10-11MB JPEG image, compared to 5-6MB JPEG image in Fine mode. There are limited controls and settings for sound on the camera, so you can't customise whether you want the shutter sound, or focus confirmation, but instead, there is simply one control for all sounds, and this is off, low, mid or high. Wi-Fi features - The Kodak PIXPRO app is reasonable, and once connected gives good control over the camera, as well as the ability to record video and control the zoom. The connection to the camera can be a bit slow but worked on our second attempt. Battery life - Battery life is rated at 400 shots according to Kodak / CIPA test results, which is good for this class of camera. 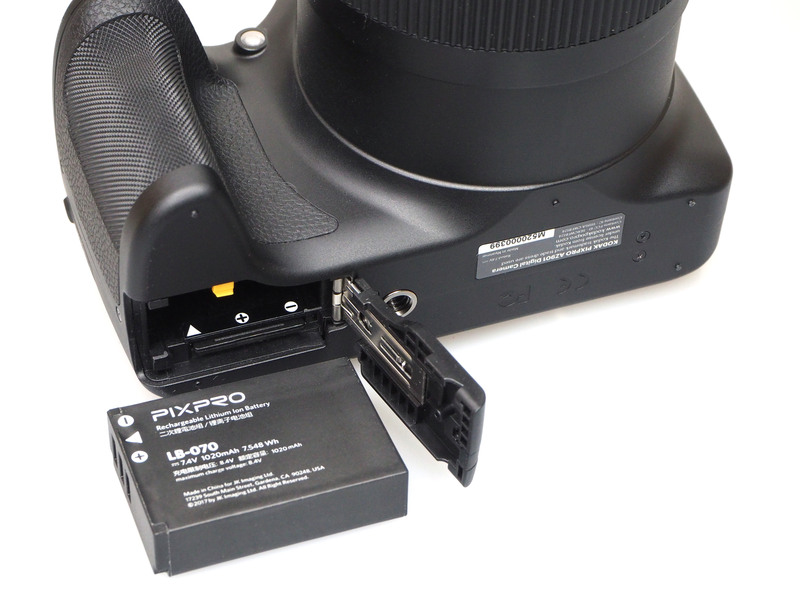 The battery is charged in the camera, using the provided MicroUSB cable. This means it will be easy to charge the battery anywhere, as USB sockets can be found in most places these days, however, we found that charging was slower when using a computer or laptop, so use of the provided AC to USB adapter is recommended. I've been shooting with the AZ901 for 3-4 months now and am completely satisfied. In total, it does most things well with very good image stabilization, very good IQ (especially with RAW), the many Scene modes work well, especially Macro. I've had no problems with focus at any focal length so not sure what the author is talking about..possibly using the wrong AF for the situation? The author claims it's heavy at 27 OZ (777g), but the Nikon P900 is heavier at 31.8oz (899g) so why the con for the Kodak Pixpro AZ901? For me, it gets down to what colors I like and the bold and rich color palette of the Kodak Pixpro cameras are my favorite with Fuji a close second. In summary, I find the AZ901 lots of fun to use, especially for birding, wildlife, and travel. Hi I use a lumix fz72 which is excellent but being a sports press photographer I need a back up camera.Do you think that the Kodak Pixpro would fit the bill ? I am in the UK but work on assignment for US publications so I need a reliable back up. Hi Dave, if you are shooting sports, these small sensor cameras are a big compromise. While I like the AZ901 and had the FZ70 (US) for a few weeks, both are not what I would consider for sports as that's dslr territory. If you are on a budget, look at the Nikon D3400 with kit 18-55 lens and grab the Nikon 70-300 DX-P lens if you need more reach. Both are sharp, light, fast AF (MUCH faster than any small sensor/p&s), silent too. Now if you were shooting wildlife or birds, I would say grab the Kodak Pixpro for it's incredible reach, but for what you do, up your game (significantly) with a dslr where it has the speedy AF, much larger sensor, able to shoot in low light with high ISO too. No comparison between the two as they are different tools for different jobs. Another alternative is to look at the Kodak Pixpro S-1 micro 4/3 sensor camera that has a sensor much larger than the AZ or similar cameras from any mfg. Check it out at BHVideo as they have the S-1 with two lens kit at $299.99 which is a excellent price for a M4/3 camera. Love mine. I have some photos at my Flickr site, click albums to view. Hi Dave, if you are shooting sports, these small sensor cameras are a big compromise. While I like the AZ901 and had the FZ70 (US) for a few weeks, both are not what I would consider for sports as that's dslr territory. If you are on a budget, look at the Nikon D3400 with kit 18-55 lens and grab the Nikon 70-300 DX-P lens if you need more reach. Both are sharp, light, fast AF (MUCH faster than any small sensor/p&s), silent too. Now if you were shooting wildlife or birds, I would say grab the Kodak Pixpro for it's incredible reach, but for what you do, up your game (significantly) with a dslr where it has the speedy AF, much larger sensor, able to shoot in low light with high ISO too. No comparison between the two as they are different tools for different jobs. Another alternative is to look at the Kodak Pixpro S-1 micro 4/3 sensor camera that has a sensor much larger than the AZ or similar cameras from any mfg. Check it out at BHVideo as they have the S-1 with two lens kit at $299.99 which is a excellent price for a M4/3 camera. Love mine. I have some photos at my Flickr site, click albums to view. Thanks for the advice Jim which is most welcome. I come from an era that used praktica SLR 35 MM cameras. I still have my original from 1964 and it works well but I only use it for home stuff not pro work. Most welcome Dave! I never used a Praktica, but I know they were/are outstanding film cameras indeed. I shot for a number of years with my Pentax ME Super and it served me well. Happy shooting!